ILYF | What Does ILYF Mean? 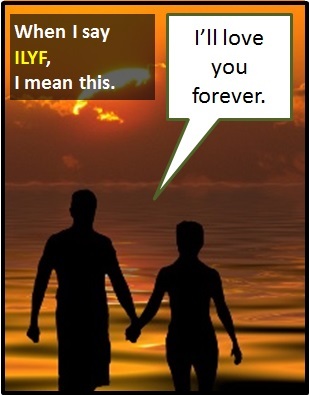 ILYF means "I'll Love You Forever". ILYF is a line that features in many love songs and poems. It is typically used to vow a deep and lasting emotional attachment to someone until the end of time (forever). However, it can also be used casually as a throwaway line to add weight to a request for a favour. The image shows a loved-up couple with one saying "I'll love you forever (ILYF)". Loved-up person A: I cannot believe that you've agreed to be my wife. I promise ILYF until the end of time itself. Loved-up person B: Oh you're so handsome...and rich ILYF too. Daughter: Can you fetch my jumper while you're upstairs please? ILYF. Mother (grudgingly): I suppose so. ILYF is used as a standalone declarative sentence (i.e., a statement). In other words, it is not used as a part of speech within a wider sentence. As it is pronounced using its individual letters (i.e., "Aye El Wye Eff"), ILYF is classified as an initialism abbreviation. Initialisms are different to acronyms, which are spoken like words.